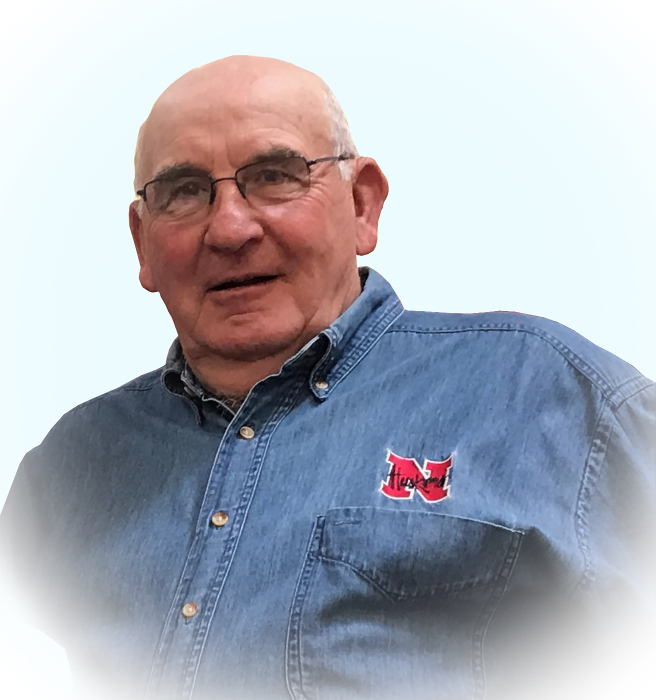 Edward "Ed" Cooney, age 77, of Arthur, passed away, Friday, March 29, 2019 at the Ogallala Community Hospital. Ed was born in Brule, NE on June 9, 1941 to Emery and Hazel (Jackson) Cooney. He graduated from Arthur County High School in 1959. Ed went on to work as a truck driver, state of NE worker, and then on to Arthur County High School where he served as custodian for 47 years. Ed loved the job and the kids at school throughout the many years he worked there until he retired. Ed lived, laughed, and loved life. Joys of his life were family, friends, Arthur Community, the Huskers and the Arthur Wolves! He could be heard whistling or singing a tune and doing a jig or two to brighten someone’s day-young and old alike. They called him Steady Eddie and said he had the patience of Job. His work in Arthur was finished, he put his shovel in the pickup and went home to his Heavenly Father. Ed enjoyed several hobbies including golfing, yard work, and 20 years of bowling league. He also played town team basketball with his son, Chad for many years. His lawn was beautiful and he loved decorating his yard for each holiday. He put many jigsaw puzzles together, the harder the better. He is preceded in death by his son, Shawn Cooney; his father, Emery Cooney; and his step-father, Clyde McDonald. Ed is survived by his loving wife, Karol, of 59 years. They were married on December 29, 1959 in Arthur, NE. Ed is lovingly remembered by his son, Chad and wife Laura Cooney and granddaughter Savanah of Arthur; his sister Cathleen and husband Pat of Kimball, NE, brother Tom and wife Heidi McDonald of Kimball, NE; mother, Hazel McDonald of Ogallala, NE. Other survivors include his in-laws, Doug and Verdena Knott of North Platte, NE, and Tim and Shelley Knott of Arthur, NE, and many nieces and nephews. Visitation will be 9:00 a.m.-1:00 p.m., Monday, April 1, 2019 at the Draucker Funeral Home Chapel, and 4:00 p.m.-6:00 p.m. in the Arthur Baptist Church. The Celebration of Life will be held at Arthur County High School gymnasium, Tuesday, April 2, 2019 at 2:00 p.m. with Pastor Blake Wilkes officiating. Burial to follow at the Arthur Cemetery. A reception will follow at the Arthur Community Building. The family asks friends to wear Husker Red or Arthur County Wolves clothing. Memorial donations may be made to Arthur Area Community Foundation.